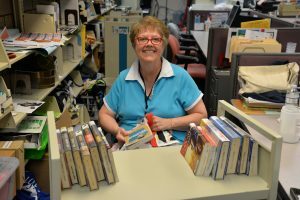 Sandi Skorniak has been an avid reader throughout her life and libraries have supplied her with an endless amount of reading materials. One of her fondest memories from childhood was walking to the library with her siblings on Saturday mornings and checking out the maximum of five books each visit. “I always read those before the weekend was over, which made it hard to wait the whole week to visit the library again,” Skorniak said. When she retired in 2014, volunteering at her local library seemed like a logical fit for Skorniak. At the time, the library needed assistance with cleaning materials or refiling books, and she opted to take on cleaning. While she agrees with the saying that one shouldn’t judge a book by its cover, Skorniak recognizes that many people do, making her role all the more important. “Presentation is everything and if a book looks clean, it’s more likely to be checked out,” Skorniak said. While cleaning library materials may seem mundane to some, it’s allows Skorniak to explore new titles, authors and genres. “I have been introduced to many new authors and all kinds of exciting things, so I really think I have the better end of this deal,” Skorniak says. Skorniak commonly leaves her volunteer shifts with four or five new titles, in addition to the titles she reserves though her OPL account online, a service she thinks is the “greatest thing since graham crackers.” While this book aficionado has always felt at home in the library, volunteering at Benson Branch has allowed her to get to know the staff, and she enjoys watching and helping them work. “It’s just like another family for me here,” Skorniak said.